Feedback includes the identification of Charles Garner, not Charles Gainer, as a pilot on the Judge Torrence. Garner’s portrait was featured in “Who Are Those Guys?’ in the July/August 2002 issue. Seven publications are listed, including Four Years With the Iron Brigade: The Civil War Journal of William Ray (DaCapo Press) edited by Lance Herdegen and Sherry Murphy, Texas Flags (Texas A&M University Press) by Robert Maberry Jr., The First World War in Photographs (Carlton Books) by Richard Holmes, Oh, What a Loansome Time I Had (University of Alabama Press) edited by Thomas W. Cutrer, The Civil War Reminiscences of General Basil W. Duke, C.S.A. (Cooper Square Press) by Basil W. Duke, Hero of the Republic: Triple Medal of Honor Winner James Madison Cutts Jr. (Burd Street Press) by Bing G. Spitler and Strange Tales of the Civil War (Burd Street Press) by Michael Sanders. 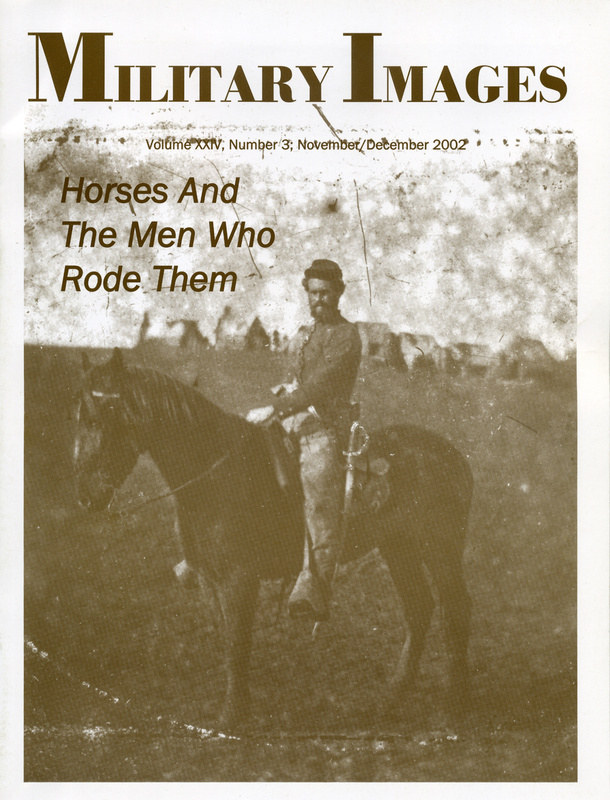 An overview of horses in the war features anecdotes and details of their service. A total of 7 photographs of men and their mounts includes Orlando Axtel of the 7th New York Cavalry of the 1st New York Mounted Rifles, an officer believed to be Col. Langhorne Wister of the Pennsylvania Bucktails, Pvt. John M. Morss of the 5th Indiana Cavalry, Pvt. William Watlington of the 3rd Indiana Cavalry and Pvt. Alvin Wiley of the 7th Indiana Cavalry. The military service of Maj. Charles Zagoni, who organized a body of cavalry recruited from recent immigrants to the St. Louis area. The men served in the command of Maj. Gen. John C. Frémont. A total of 5 images document unusual uniforms. None of the men are identified. Since 1982, Mantle has collected hard-plate images. Representative examples of his cavalrymen number 8 in total, all of who are unidentified. A total of 6 portraits include Pvt. John “Jack” T. Teass of the 2nd Virginia, Pvt. Francis Jones of the 8th Virginia, 1st Lt. Thomas H. Wells of the 7th Kentucky, Pvt. Bentley Weston of the 7th South Carolina, an unidentified trooper from a Baltimore estate and a private believed to be from the 1st Maryland. A brief history of the regiment is illustrated with portraits of Adolphus Ruff, R.W. Armstrong, Sylvester S. Ransom and Daniel Tompkins. A collection of 4 images includes two ambrotypes, one tintype and an unidentified hard-plate format. An immigrant from Prussia, Brado enlisted in the 3rd in the summer of 1861. He survived the war and lived until 1919. The text is illustrated with his portrait. A profile of a uniquely trimmed cavalry jacket worn by troopers in two cavalry regiments, the 1st Ohio and 2nd Missouri. The author profiles this unusual rifle, which includes a list of all the cavalry and infantry regiments who carried them. Three portraits illustrate the text, and two of the subjects are identified: Pvt. Thaddeus M. Southworth of the 2nd Michigan Cavalry and Pvt. Joseph Cowden of the 42nd Illinois Infantry. The U.S. army had cavalrymen in its ranks before and after the Civil War, though never again or before in such numbers. Four non-Civil War images show cavalrymen from antebellum times through World War I. Identified men include Commissary Sgt. J. Howard Lotz, circa 1895, and Musician Charles P. Christian and his friend Annie McArbug, circa 1880-1885. William Baya, a native of Florida, served in a Confederate Marine company early in the war before joining the 8th Florida Infantry. He saw much action in many of the major Virginia battles and ended the war as colonel of the 5th Florida Infantry. He survived the war and lived until 1903. Pvt. Isaac Wayne Van Leer, a member of Company B of the 53rd Pennsylvania Infantry, made this statement in a letter to his brother during the early part of his service. The words were somewhat prophetic. During the Peninsula Campaign and the Siege of Yorktown, Van Leer suffered a severe wound in the ankle and a bullet to his head that knocked him unconscious. An advancing Confederate then pierced him in the side with a bayonet. Van Lee succumbed to his wound soon after, just for days shy of his 16th birthday. The time-honored tradition of boat racing is noted here with anecdotes of several such contests, including one between cutters from the Illinois and the Kearsarge in 1905. The text is illustrated with a portrait of Asst. Surg. Samuel Pellman Boyer, a competition cup, and the crew of the cutter from the Illinois. A photograph of Ross wearing the militia uniform of the Fort Harrison Guard of Terre Haute, Ind., illustrates a sketch of his life and military service, including his wounding at the Battle of Shiloh. Benjamin Franklin Littlefield of Cicero, N.Y., started his service with the 1st U.S. Sharpshooters. He left the regiment in 1862 with a disability discharge and returned to the army in 1863 with the 11th New York Heavy Artillery using the name Frank B. Littlefield. He survived the war and died in 1886. Cyrus Butler began his service in the 11th Pennsylvania Reserve Volunteers as a first sergeant and was soon promoted to lieutenant. Captured and Gaines’ Mill and wounded at Fredericksburg, he left the regiment in April 1863. He returned to duty during the invasion of Robert E. Lee’s army in the summer of 1863 and remained in uniform until Oct. 30, 1864, when he was killed by a draft dodger resisting arrest. A biography of two of the Union navy’s most promising young officers, Roswell Hawks Lamson and William B. Cushing. Three images of an antebellum and Civil War era military men from the Norwegian Museum of Photography are attributed to a private collection of a man named Preus. In “The 2nd New Hampshire Infantry,” McAfee explores the gray jacket worn by the New Englanders. The text is illustrated with a portrait of an unidentified private. A quarter-plate ambrotype from the Kean Wilcox collection pictures a Confederate wearing a coarse jeans cloth coat with buttons made of what appears to be wood or bone.